But that’s not all it’ll do for you. Thanks to the new accessibility features, it’s easier than ever to navigate your way around your library or your books; create notes, bookmarks, and highlights; use features like X-Ray, End Actions and sharing via social networks; and look up words in the dictionary or on Wikipedia. Amazon hopes that the introduction of these features will help the visually impaired enjoy Kindle’s vast library of titles. 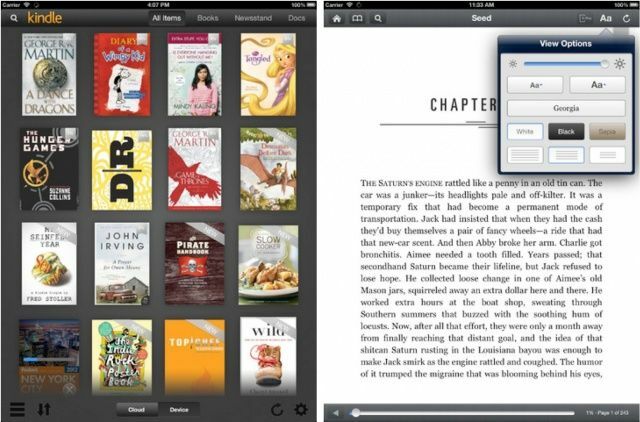 “We’re excited to introduce these new features to our Kindle for iOS app, making it easier than ever for our blind and visually impaired customers to access the vast selection of over 1.8 million books in the Kindle Store on their iPhone or iPad,” said Dorothy Nicholls, Vice President, Amazon Kindle. The latest Kindle release is available to download from the App Store now. To take advantage of VoiceOver within the Kindle app, you’ll need to enable it in the Settings app on your iOS device.